South Asian Union: Dream reality? a closer-knit South Asian community is not beyond the realms of possibility now. At the 12th South Asian Association for Regional Cooperation (saarc) summit in Islamabad from January 4-6, leaders of the region took some of the boldest steps ever since the grouping was first created in 1985. They agreed to make poverty alleviation their topmost priority and foster economic cooperation by freeing up trade within the region. "South Asia is out of step with other parts of the world, which were able to transcend their differences and disputes and embark on a steady course to economic growth and development," observed Pakistani Prime Minister (pm) Mir Zafarullah Khan Jamali at the meeting. "These examples remind us that rational economics should triumph over political prejudice in South Asia," stressed India's pm, Atal Bihari Vajpayee. Taking the cue from such statements, the seven saarc members set aside their differences and adopted the Islamabad Declaration. It endorses two critical agreements -- a Social Charter and a Framework Agreement on South Asian Free Trade Area (safta). While the former seeks to achieve greater cooperation among members of the combine on issues of poverty alleviation, health and education, the latter aims to eliminate barriers to the free flow of goods within the region. Fighting poverty With a third of its population living below the poverty line, South Asia accounts for the highest number of poor in any region. Though only a declaration of intent, the charter creates a sense of shared desire among saarc members to protect their people. It links the empowerment of the poor with mainstream development. The document talks about sharing medical knowledge and expertise, and meeting the target of providing free education to all children between six to 14 years of age. The Islamabad Declaration also instructs the Independent South Asian Commission for Poverty Alleviation, a body of experts from the region, to prepare a blueprint setting out saarc's Development Goals for the next five years in areas of poverty alleviation, education, health and the environment. Removing trade barriers The leaders at the summit committed themselves to the creation of a South Asian Economic Union with free trade, open borders and a single currency. Vajpayee pointed out: "The development of greater economic stakes in each other would naturally result in greater sensitivity to the concerns of each other." safta is a step in that direction. "The major gain from this summit is that through safta the regional economic integration agenda has been put back on track," said Nagesh Kumar, director-general of New Delhi-based think-tank Research and Information Systems for Non-aligned and Developing Countries. safta aims to bring custom duties (tariffs) charged at the borders for each other's products down to 0-5 per cent on all goods, except on a few sensitive items to be negotiated. 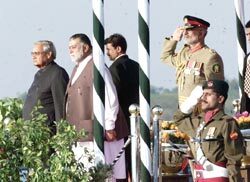 While India and Pakistan will have to achieve this target within seven years of the agreement's implementation, Sri Lanka will have eight years to do so. The least developed countries (ldcs) of the region, including Bangladesh, Bhutan, Maldives and Nepal, will get 10 years. The agreement is expected to come into force from January 1, 2006. The non-ldcs will be required to reduce their tariffs to 0-5 per cent for products originating from the region's ldcs within three years of the pact becoming operative. The Energy Ring Envisaging closer cooperation in areas of energy, food security and the environment, the Islamabad Declaration calls for a study on the concept of an Energy Ring. This would facilitate energy trading between saarc countries through the interconnectivity of grids or other mechanisms. It proposes mutual assistance in the conservation of water resources and the environment, pollution prevention and control as well as preparedness to deal with natural calamities. It also recommends the drafting of a Regional Environment Treaty. The attempt to comprehensively address a whole range of economic and social issues at the summit offered both an opportunity and a challenge to saarc countries. The President of Maldives, saarc's smallest member, put it aptly: "If we proceed with determination, trust and good faith, we have nothing to lose except the baggage of the past and a history of pain and problems."